There were several photos of a new Seven Woods Audio SST-201 at Music Messe. I received a reply from Chris Moore today with more details, along with a photo. 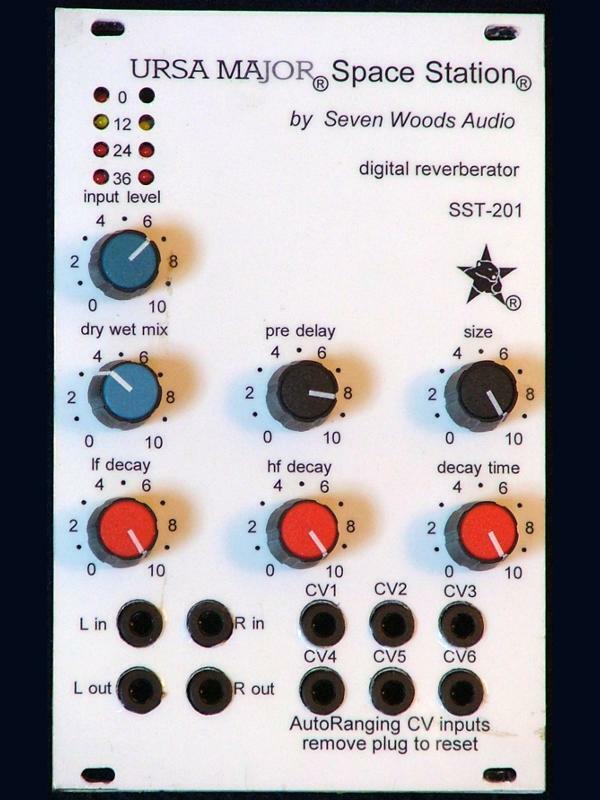 The SST-201 is a Euro rack module that essentially incorporates the room program from the SST-206 (and only that program, not the original SST-282 or -206 algorithms. It has stereo in and out on mono 3.5mm connectors, and six parameters under user control - and under CV control. With no CV plugs inserted, it responds to simple pot setting. When a plug is inserted in say the HF decay jack, control shifts to the input connector and the panel pot (the pot simply scales from 0 to 100% the control voltage. The module goes into a sort of learn mode when a CV source is active, seeking to learn the CV range of the source. After learning the range of max - min, the module scales itself and compensates for the full range whether 0 - 5V, -2.5 to +2.5, etc. Every attempt at reducing glitching as the parameters are swept will be taken. A hidden DIP switch allows for Input and output sensitivities ranging from +/- 1.25V input and output level down to +/-10V sensitivity in 3 6dB steps. Status: I am still working with rev 0 PCB and will be making some changes before proceeding with the first batch. Estimate is 2 months to first, limited run of 25 pieces. US dealer is Analogue Haven. The price will be approximately $995 USD MSRP. He mentioned that Analogue Haven will be the exclusive US dealer. I used the 201's bigger brother SST-206 on a youtube video featuring the Oberheim Two Voice. The sound of the 206 is well suited for use with synthesizers. I hope the sole room program in the 201 will be adequate.